Forest of Dean Pest Control Specialists in the control and exclusion of Wild Boar from your property including allotments, farmland gardens and verges. In areas where wild boar have become urbanised, they lose their fear of people as they learn that they are less likely to get shot at, than when in the woodlands. They become accustomed to rummaging through gardens, grass verges and rubbish bins for discarded food items. 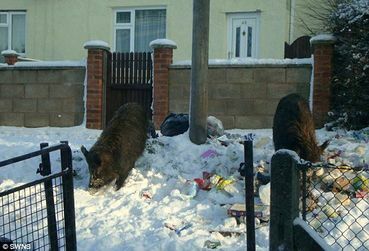 Urban wild boar, in comparison with other wild animals that become urbanised, can lead to problems of aggression, road traffic accidents and disease spread.